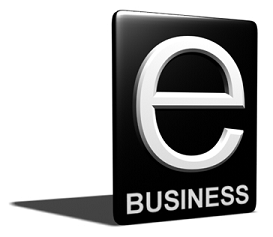 Before talking about E-business software it's worth noting what the term of E-business means. E-business (electronic business) is a notion which means a business held over the Internet with the help of information and communication technologies. E-commerce which assumes different types of transactions between groups, businesses and individuals constitutes an essential part of E-business. Due to electronic business methods companies have a possibility to link their internal and external data processing systems in more efficient and flexible way, to work more closely with suppliers, affiliates and partners. E-business focuses more on the strategics of E-commerce, E-commerce is a way to get revenue from your business. To ensure the exchange of data between companies, special technical standards for e-business were created. E-business software solutions allow the integration of intra and inter firm business processes. E-business can be conducted using the Web, the Internet, intranets, extranets, or some combination of these. 1. Content Management Systems (or CMS) is an essential part of E-business software which is used to ensure ans to organize the process of creating, editing and managing content. In particular CMS for E-business is represented by shopping cart software allowing to launch and manage webstore, to make all operations necessary for E-business. The main aim of such a system is a possibility to get together and unify various sources of knowledges and information, as well as a possibility to ensure the interactions between employees, administrators and users, and databases. 2. Payment Gateways & Credit Cards – tools allowing to receive payments from consumers and transfer them from one account into another. Payment gateway represents an e-commerce application service provider service that authorizes payments for e-commerce webstores, online retailers. It is the analogue of a physical point of sale terminal located near most real webstores. Payment gateways were created to protect credit card details by encrypting sensitive information, such as credit card numbers, to ensure that information is passed securely from the customer to the merchant as well as from merchant to payment processor or vis-versa. "Alright arlihgt alright that's exactly what I needed!"